It’ll will be here before you know it. Now’s the time to reconcile and check what what invoices are still outstanding and pick up the phone. This week’s your last chance before Christmas. 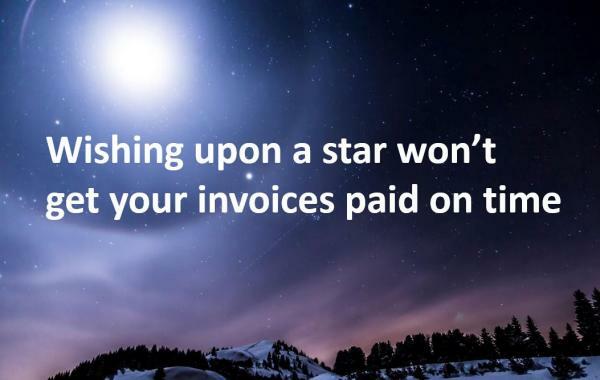 Unpaid invoices and late payments are a huge problem for small businesses. Not having a steady stream of income is probably the biggest cause of stress leading up to Christmas and the end of the year. Worrying about cash flow becomes a burden. It’s stressful being concerned about paying your own bills. You can’t concentrate on building your business or having fun with your family. And the problem affects more businesses than we know. Just this week I read a cry for help from someone on the 4Networking Community. Someone who’s clearly worried, has gone down the route of debt collection and doesn’t know what to do next. I’ve recently engaged in the services of a credit control company to help me collect money from a late paying client. However, I’m rather disappointed in their service as I don’t feel like they have been as communicative to me or my client as I’d like. I don’t feel they have helped very much in getting this money out of my client as I feel I have still had to do a lot of the chasing up myself, which I have no experience in and I’m not having any success so far. And my client is still owing me this money.! Engaging the services of a debt collection agency should be a last resort. There are plenty of options which I’ve shared in my blog posts: The secret to getting your invoices paid on time and CCJ or Debt Collection? When should you chase invoice payment? It all depends what your terms are and what you’ve agreed with the customer. One example is payment up front (and there’s no reason why you shouldn’t have this in your terms). Payment up front means you shouldn’t be starting any work until you get the payment so if it it means having to chase it up, it’s good for you and good for the customer. It’s in their interests to settle as soon as possible and prevent any delays. I know it feels a bit awkward, picking up the phone to chase an invoice payment. Sometimes, instead of asking what we really want to, which is when will you pay my invoices, we’ll start gently and lead into the question with a conversation about the weather. The reason we do this is because it makes us feel a little bit uncomfortable and for some reason, us Brits are very embarrassed when it comes to talking about money and sometimes we leave it too long and way too late to have that conversation. If you leave the call until payment is overdue, then it makes for a far more difficult conversation. We sometimes panic about making that call but it’ll be you that’s panicking at the end of the month if that invoice isn’t paid by the time your own business bills are due. If we realised the impact this had on our cashflow, we wouldn’t hesitate in picking up the phone and getting to the point. Chasing overdue payments – when is the best time to phone your client? Should I use email or phone calls to chase my invoices efficiently? 4 easy ways to stay in touch with your customers and how that can help you get paid. Talk to Rachael. I’m not a debt collection agency but I specialise in helping people get paid on time. How? By helping you to put in place terms, conditions, contracts and invoicing procedures which provide clear expectations for you and the customer and get you paid on time. If you ask me to help you with your processes, I’ll make sure your cash flow accelerates. Let’s speed it up together. I’ll help you become confident enough to get paid up front and save time chasing invoices. I get a kick out freeing my clients from the stress of wondering where the money’s coming from to cover their costs. And love it when they can focus on business growth because they get paid on time, or faster.